Cheesecake - who doesn't love it? It's so versatile and can be eaten with almost any type of toppings. 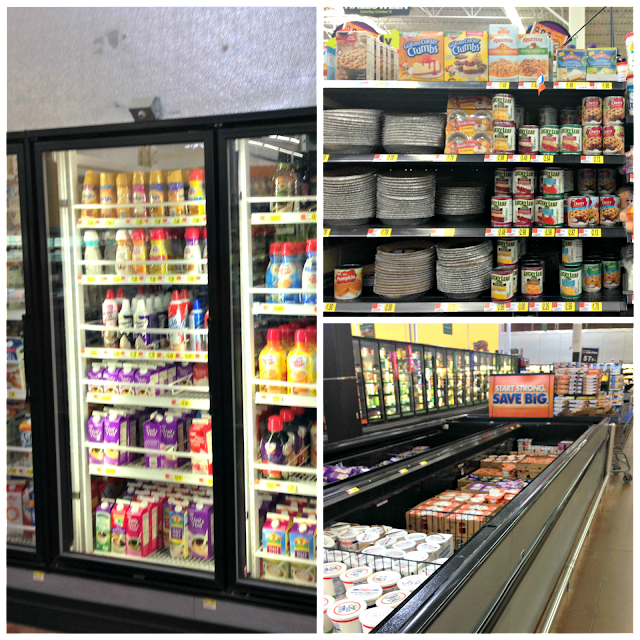 Cheesecake can be baked, it can be refrigerated, it can be made full-fat, or it can be made with healthier options. But no matter how you eat it, it's delicious. 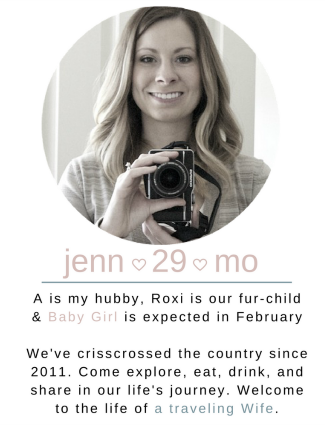 My favorite kind of cheesecake is one that someone makes for me - kidding, but not really! If I need to make one myself, I always go for the no-bake option. Even better if it can be made in under 5 minutes. Have no fear, if you are in need of a cheesecake, I have a five minute recipe for you to make individual sized no-bake cheesecake. The past few years I have been a lover of making cheesecake with greek yogurt. 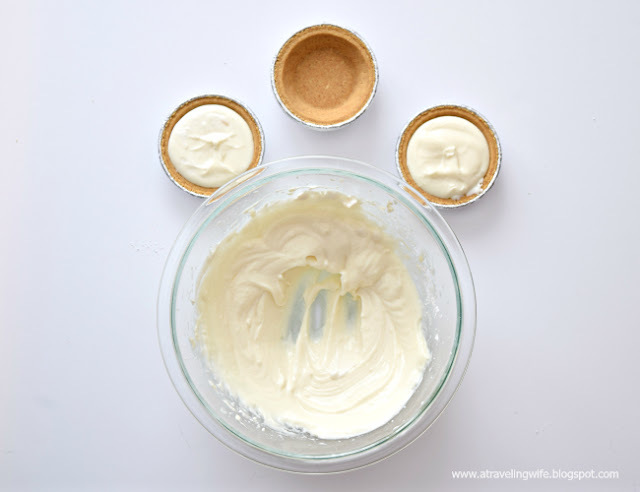 I used to always use plain greek yogurt then top the cheesecake with some type of pie filling. This way I started out with a plain cheesecake and people could pick and choose which toppings they wanted on top. However recently, I have been incorporating a flavored greek yogurt to my cheesecake to create a decadent dessert. The five minute no-bake cheesecake recipe only calls for five ingredients. I'm telling you, you could make this in your sleep. The ingredients you will need are Keebler® Ready Crust® Mini Graham Cracker Pie Crust, Reddi-wip® original, powdered sugar, Neufchatel Cheese (cream cheese), and greek yogurt of your choice - all available at Walmart, which is where I bought my ingredients. First you will want to work with room temperature cream cheese. 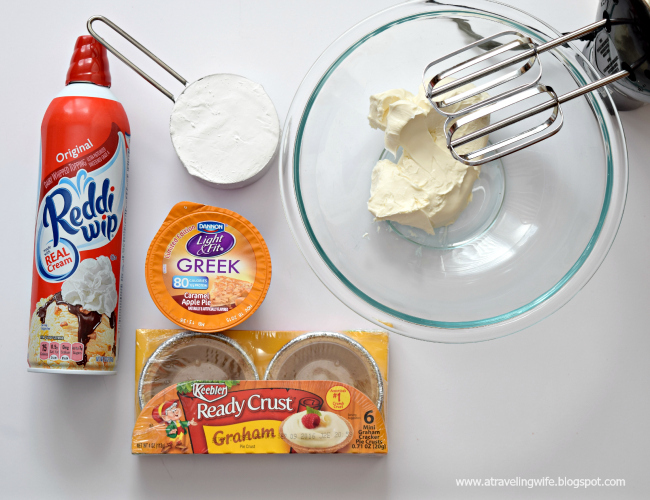 This will make it much easier to mix and will give you a creamier cheesecake. Then you will whip Neufchatel Cheese, powdered sugar and greek yogurt until smooth. 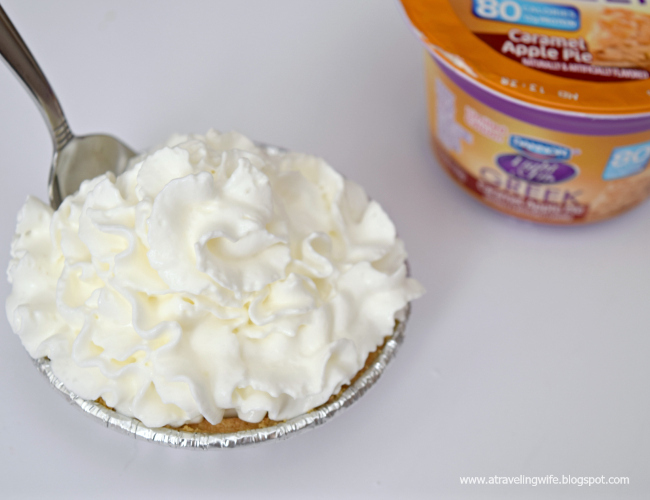 For this particular recipe I used Light & Fit® Carmel Apple Pie Yogurt and it was AMAZING. I scooped about 1/4 cup of the cheesecake filling into the Keebler® Ready Crust® Mini Graham Cracker Pie Crust. These are perfect for the holiday festivities coming up because everyone can enjoy their very own cheesecake - the crust is my favorite part. Look at how perfect these individual cheesecakes are. You can enjoy them right away with some Reddi-wip® original or you can refrigerate them for an hour or two to set. Either way, they are delicious and I dare you to only eat one. 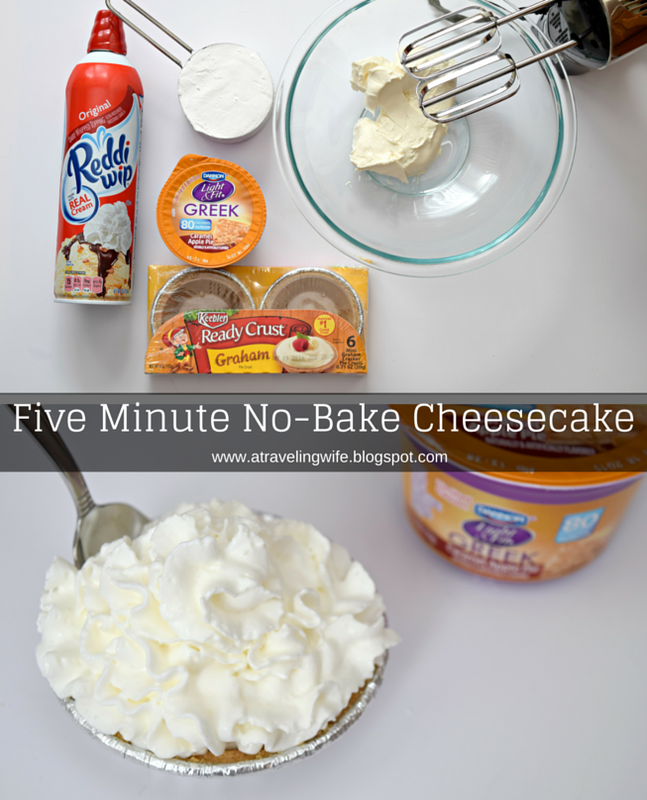 Click to tweet: I'm drooling over this five minute no-bake cheesecake. - Whip room temperature Neufchatel cheese, powdered sugar, and Light & Fit® Carmel Apple Pie Yogurt in a medium mixing bowl until smooth. 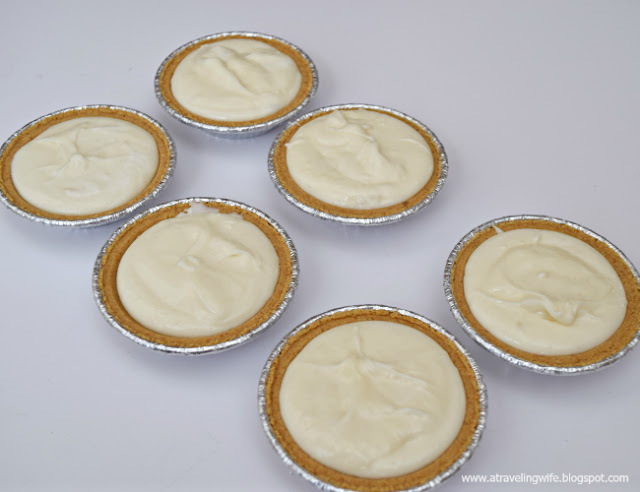 - Fill Keebler® Ready Crust® Mini Graham Cracker Pie Crust with 1/4 cup cheesecake filling. Optional* Refrigerate for 1-2 hours. - Enjoy with Reddi-wip® original and a spoon. What kind of effortless desserts do you make? Here are some more ideas to help you create effortless pies. I have never had cheesecake before in my life! HOW CRAZY is that?!?!? Well that needs to change ASAP. There are so many different varieties, I'm sure you'll find more than one to love! Yesss!! Cheese cake is one of my FAVORITE desserts. The creamier, the better ;). Love topping it with whipped cream, too.